"His heartbeat became stronger and stronger, like drums announcing a battle. His veins became swollen and exposed the blood inside of them. And those green eyes with that deep glare were scared, lost and released a red tear as thick as lava…and he saw the red tear falling in slow motion. And when the tear hit the ground, along with it, fell his whole body that could not take it anymore, and along his body came down his eyelashes that felt like two giant pieces of metal that hit his face and closed his eyes with a dry shocking punch. Maybe one or two seconds passed by, maybe none…no one can be precise about time in that place where he opened up his eyes for the first time. Slowly and shyly, he moved his head around from side to side, up and down like wanting to take mental pictures of every single detail, every millimetre, every strange thing that presented itself. -¡What a strange dream! He thought. I must have certainly fell asleep or passed out He said. But either way he felt the desire of penetrating a little bit more into that place and his entire being drove him into standing up and allowing curiosity to take its course. His reason gave no credit to what his eyes were seeing; his imagination was too short to process the details that came from that strange place where he had bizarrely appeared. He got himself together, filled himself with courage and started walking forwards; slow steps and a little coward at first, but steps after all. In front of him, the most absurd scenes anyone could ever think or imagine. Over a long and stretched road, giant and strong ants carried on their backs all sorts of things: chunks of candy, pieces of chocolate, small peanuts, popcorn, like a group of ants that had just gone to the movies to pick up crumbs under the seats. The giant and strong ants walked like soldiers, precise and in a uniform line without stopping or turning to see anything but their way. They were walking towards to what seemed to be an enormous warehouse made out of something that looked like a root, or at least it seemed like one. In the air stood what seemed like an enormous light, like a light bulb from a house, the ones you use to light up gardens and it hung from a wire that was placed under a tree. The light bulb must have been gigantic or everything there was very small. On the other hand, some clumsy beetles were flying by and they bumped against each other and with everything on their way. They carried on top of them empty match cases that were used to transport all sorts of utensils, machinery, things that human eye has not seen yet. It was an underground city, were the insects seemed to work together like in a community, organized and structured in complete harmony. There were worms in charge of digging up tunnels were maggots walked through leaving behind some sort of slime that served as cement to make the walls of the tunnels stronger. Outside these tunnels, there was a large, but very large villa. A plateau with strange but beautiful flowers, trees like bonsais, rivers crossing everywhere and falling into spectacular cascades. The colours of that show were bright, strong toned and colourful. Most of its inhabitants flying around the skies or the ones walking or crawling were not familiar to that man that could not come out of his amazement. -¡Hey you! Said a tiny voice. The man turned his head around but saw nothing." 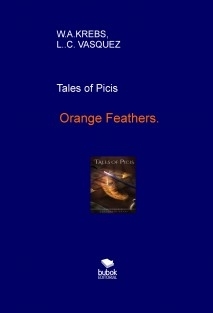 Once upon a time,…there were the Picis.